Happy last day of February! Today I wanted to share with you another one of my favorite paint colors this month. Crushed Ice with pops of turquoise and yellow. More Crushed Ice inspiration from Emily Henderson. And a GORGEOUS paint palette from Vim and Vintage. Soft grays, blues, beiges – again, love, love, love. 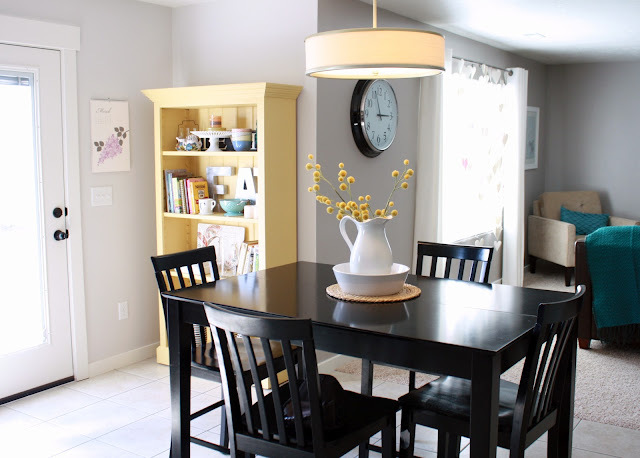 If you missed my favorite paint color for January, you can check it out here. Thank you for letting me share another one of my favorite colors with you today. I hope everyone has a fabulous weekend. We are staying inside to keep warm, there is a raging blizzard outside and school is CANCELLED. School never gets cancelled in Montana so we are taking advantage of our snow day here. See you next week!